On Sale Now! 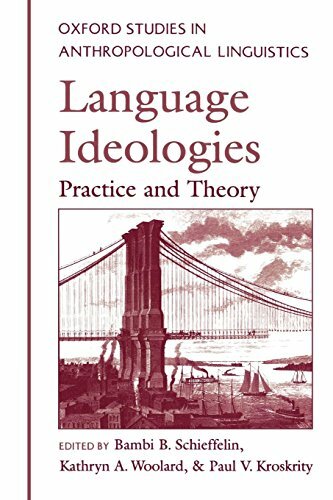 Save 8% on the Language Ideologies: Practice and Theory (Oxford Studies in Anthropological Linguistics) by Brand: Oxford University Press, USA at Translate This Website. MPN: Illustrations, 1 map. Hurry! Limited time offer. Offer valid only while supplies last. ''Language ideologies'' are cultural representations, whether explicit or implicit, of the intersection of language and human beings in a social world. "Language ideologies" are cultural representations, whether explicit or implicit, of the intersection of language and human beings in a social world. Mediating between social structures and forms of talk, such ideologies are not only about language. Rather, they link language to identity, power, aesthetics, morality and epistemology. Through such linkages, language ideologies underpin not only linguistic form and use, but also significant social institutions and fundamental notions of person and community. The essays in this new volume examine definitions and conceptions of language in a wide range of societies around the world. Beginning with an introductory survey of language ideology as a field of inquiry, the volume is organized in three parts. Part I, "Scope and Force of Dominant Conceptions of Language," focuses on the propensity of cultural models of language developed in one social domain to affect linguistic and social behavior across domains. Part II, "Language Ideology in Institutions of Power," continues the examination of the force of specific language beliefs, but narrows the scope to the central role that language ideologies play in the functioning of particular institutions of power such as the law, mass media, or nationalism. Part III, "Multiplicity and Contention among Ideologies," emphasizes the existence of variability, contradiction, and struggles among ideologies within any given society. This will be the first collection of work to appear in this rapidly growing field, which bridges linguistic and social theory. It will greatly interest linguistic anthropologists, social and cultural anthropologists, sociolinguists, historians, cultural studies, communications, and folklore scholars.